City of Oconto - B&M Technical Services, Inc. 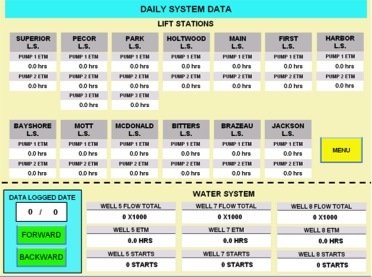 The intent of this project was to update both the City water and wastewater control and telemetry systems. 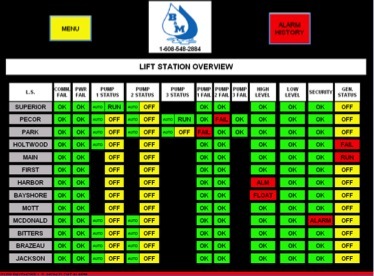 At the water sites, Allen Bradley Micrologix controllers were programmed and installed for control and communications. 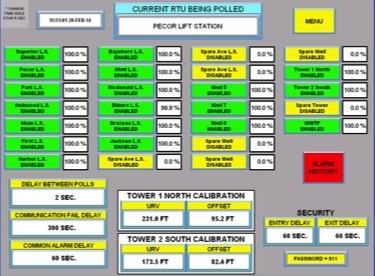 At each lift station, the MPE SC2000 was installed with transducer and float backup controls. Radios were all replaced with MDS SD04 radios. 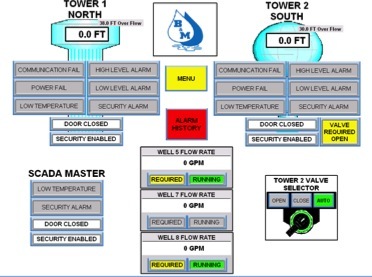 At the master site, a master PLC, 15" color touchscreen (see selected screenshots below), and Antx 500 channel dialer was installed for data retrieval, overview, storage, and alarm notification.